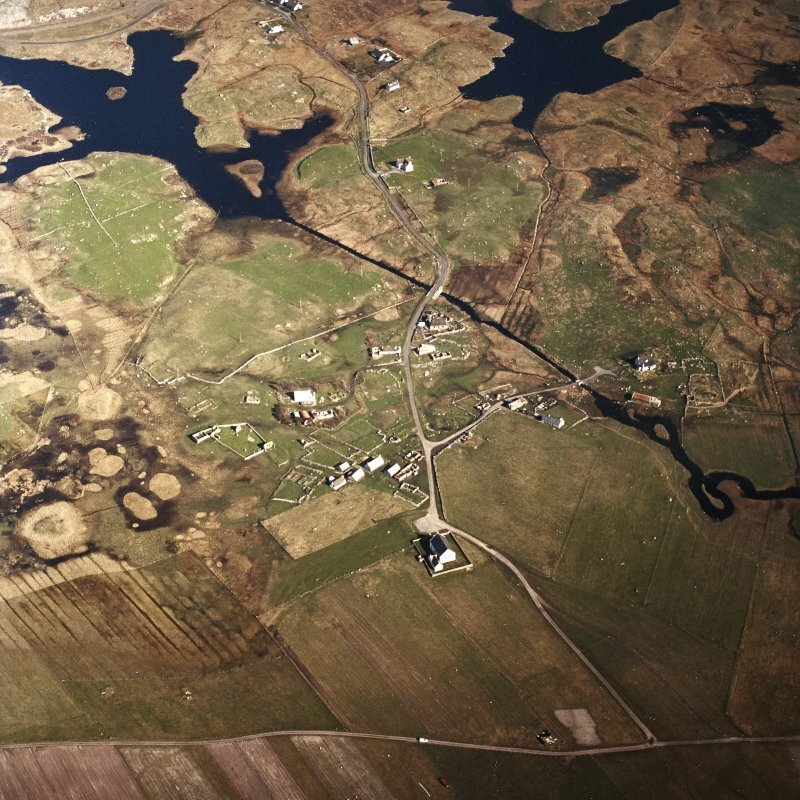 Oblique aerial view centred on the remains of the farmsteads, with the farmstead and the township adjacent, taken from the SW.
Oblique aerial view centred on the remains of the farmsteads, with the farmstead and the township adjacent, taken from the SSW. Oblique aerial view centred on the township with the church and the remains of the churches and the chapels adjacent, taken from the NW. 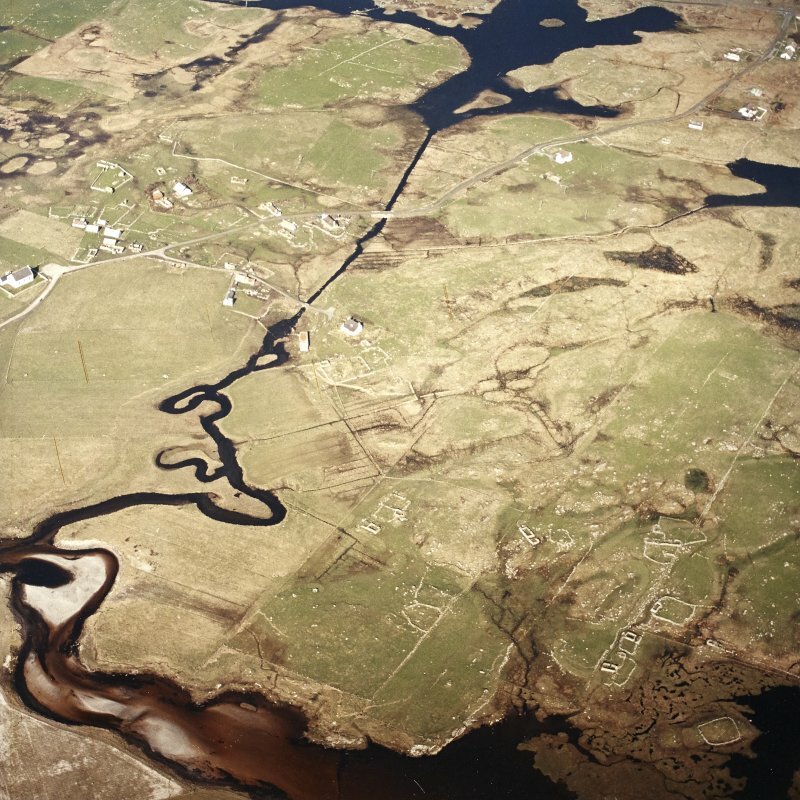 Oblique aerial view centred on Howmore township, South Uist, with the church and the remains of the churches and the chapels adjacent, taken from the WNW. Oblique aerial view centred on the township with the church and the remains of the churches and the chapels adjacent, taken from the WNW. 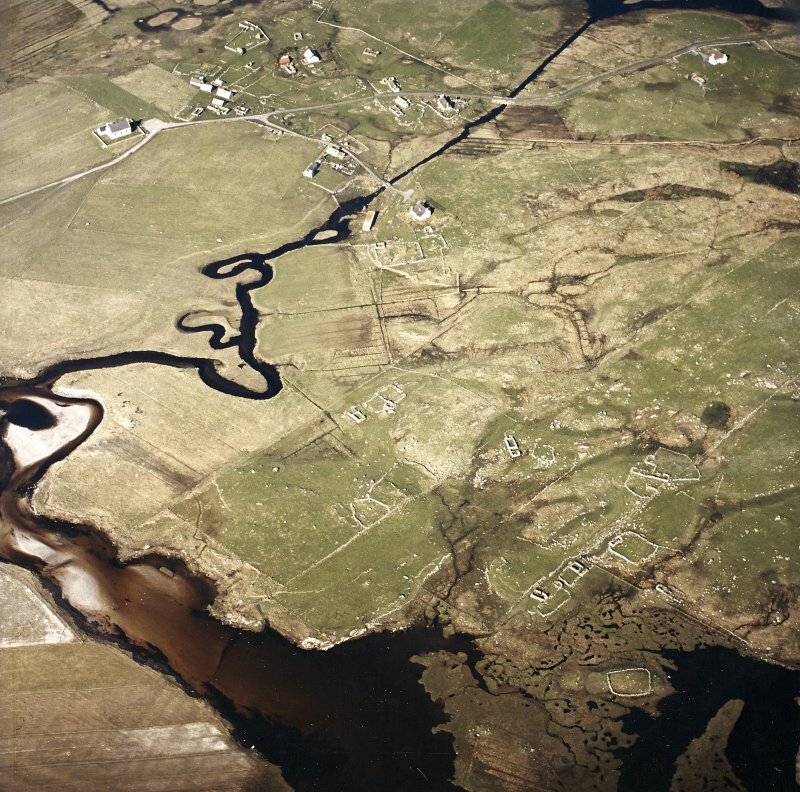 Oblique aerial view centred on the township with the church and the remains of the churches and the chapels adjacent, taken from the W.
Oblique aerial view centred on the remains of the farmsteads, with the farmstead and Howmore township, South Uist, adjacent, taken from the SSW. 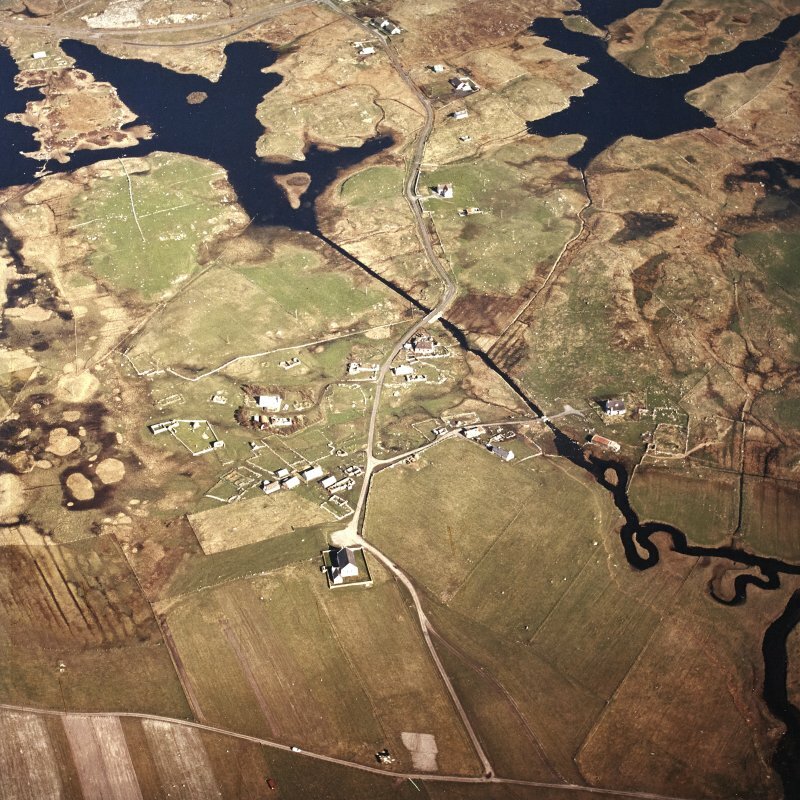 A township comprising thirty-four roofed, two partially roofed and three unroofed buildings is depicted on the 1st edition of the OS 6-inch map (Inverness-shire, Hebrides, South Uist 1881, sheet l). Sixteen roofed, one partially roofed and eleven unroofed buildings are shown on the current edition of the OS 1:10000 map (1972). 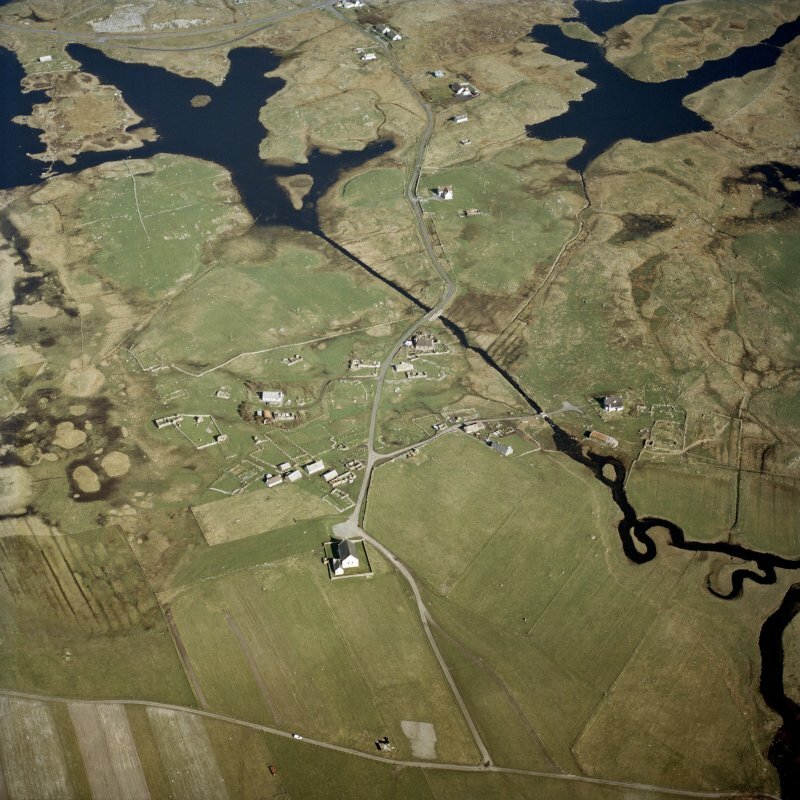 NF 75861 36365 For two weeks in March 2006, I undertook an archaeological evaluation in advance of a proposed housing development at Howmore, South Uist, less than 50m to the SE of the sSheduled ancient monuments at Teampull Moire. 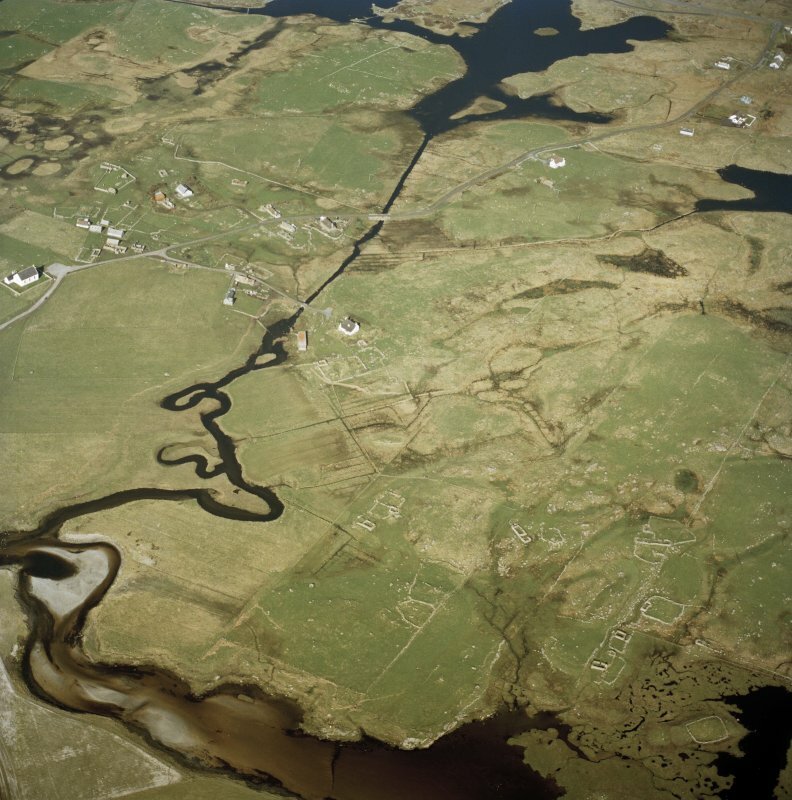 The evaluation opened up seven small trenches (2 x 3m and 4 x 4m) on the top of a raised mound measuring 25 x 25m and lying within boggy surroundings. The mound was surrounded by a partially buried drystone revetting wall. There were also three ruined drystone buildings around the periphery of the mound. These were known locally to have been used for housing livestock at certain times of the year. The evaluation revealed that the mound was natural in origin. Most trenches were archaeologically sterile with the exception of two on the very top of the mound where three roughly circular areas of rounded stone cobbles were placed to form levelled surfaces, each measuring approximately 1.5 x 1.5m where revealed in the trench. In addition there were two small stone arcs or semi-circles, and two short stone rows measuring less than 0.6m in length. All of these features were below the shallow topsoil and resting on subsoil that was interspersed with fragments of 20th-century willow pattern earthenware (including underneath the stones). 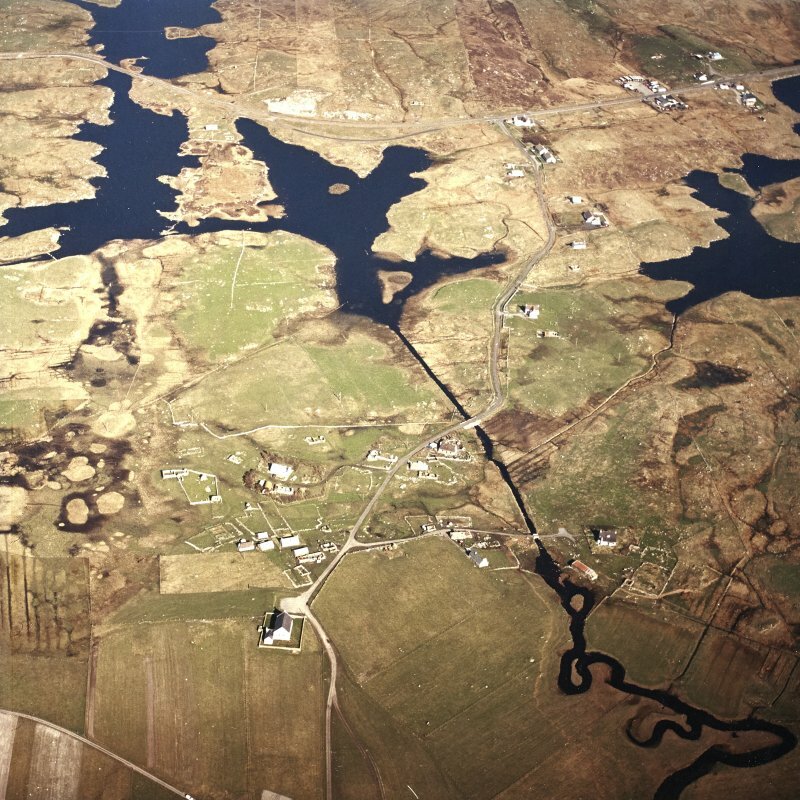 When asked to come and look at the site, the local landowner Donald Macneill recalled the use of this site as a hay yard. It became apparent that the revetting wall was constructed to keep animals out rather than in. The top of the mound was used periodically for the keeping of both hayricks and corn stacks. The levelled cobbled surfaces were laid in order to keep corn dry for feeding livestock, to prevent any rotting from below. The other stone features related to the traditional practice of raising hayricks, where a linear stone (sometimes wood) setting was used as a base for the ricks, again to prevent rotting, and the circular setting acted as a sort of central 'chimney' to allow air to circulate at the centre of the structure, therefore keeping it dry from the inside. Copy to be deposited in the NMRS. Sponsors: Mr Thomas Fisher and Mrs Julie Lewis.